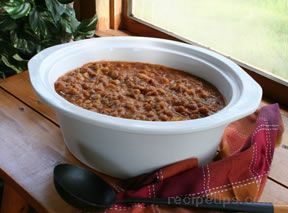 These crock pot beans are an easy side dish for a picnic or a crowd. 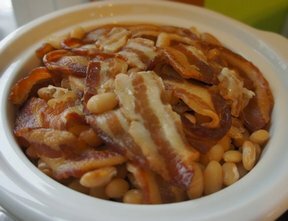 In a large skillet, cook bacon until it is lightly browned. Add onion and celery and continue cooking until vegetables are soft. 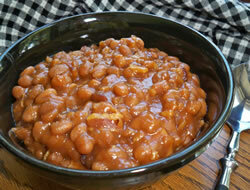 Pour drained beans into slow cooker. Add bacon mixture and combine. In a small bowl, combine liquid smoke, mustard, molasses, ketchup, brown sugar, and vinegar. Stir. Add mixture to slow cooker and stir until well combined. 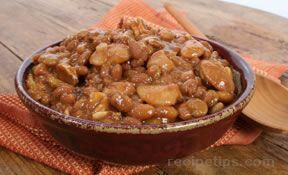 Turn slow cooker on high for 4 hours or on low for 7 hours. This dish can be baked the day before. Store in refrigerator and reheat before serving.